You could receive 50 Supps Points for writing a review and/or rating this product. WITH BETTER GIFT FOR LARGER SPENDS! EARN SUPPS POINTS &AMP; SAVE! 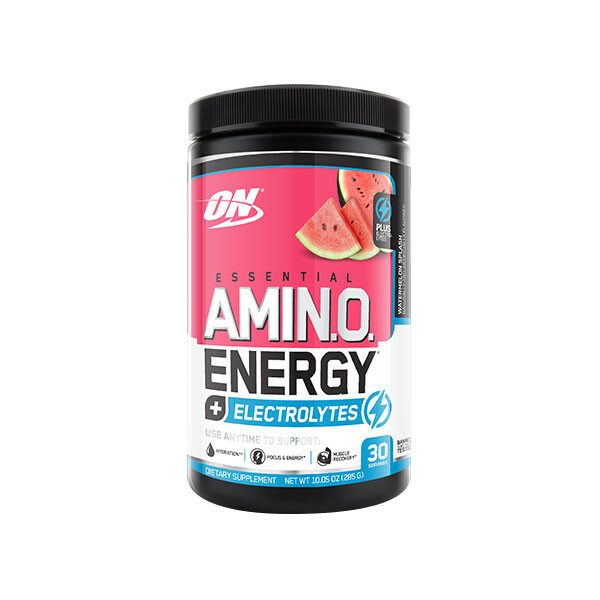 Mix up ESSENTIAL AMINO ENERGY™ + ELECTROLYTES anytime you want a fruit flavored boost of energy with amino acids for muscle supports and electrolytes to help replace what’s lost through sweat. You can determine what's appropriate for any situation, adding a 2-scoop serving to cold water for an afternoon pick-me-up or increasing the performance matrix to 4 or 6 scoops. We realise that some sites charge ridiculous amounts on postage, We think that is non-sense! We’re pretty keen on giving you the best experience possible, so it's only $9.95 FLAT RATE AUSTRALIA wide on orders under $99. For orders over $99, we offer FREE Postage Australia Wide with tracking and signature on delivery to make sure your order never goes missing. So make sure you load up your cart and take advantage of the FREE postage on orders above $99. We currently use Australia Post services ONLY to ensure the fastest delivery to your door. This means we can post to both street addresses and to a P.O. Box address! Both the Regular Post service as well as the EXPRESS post service are track-able and require a signature on delivery for peace of mind! Once your item is posted, you will receive an email from us advising you that it has been dispatched. You will also receive an email which contains your tracking number. To track your order, simply visit http://auspost.com.au/track and enter your tracking number. If your delivery seems to be taking too long please phone us on 1300 252 355 or email us info@suppsrus.com.au and we will sort it out for you immediately. Un-opened items can be returned or exchanged. Simply send the items back to us within 14 days of receipt and we will refund your money or exchange your product. When we receive your package we will credit the card you paid us with for the full purchase price of your product. In the event of returning a free postage item there is a mandatory deduction of $9.95 from your total refund. Damaged & Incorrect Items: At Supps R US we do our best to package your product(s) so they will arrive to you in excellent condition. Unfortunately, once the package leaves our warehouse, it goes through many hands and products may shift causing unintentional damage. Should you receive a product that has been damaged in transit, please contact us immediately for further instructions. Please do not discard the damaged product(s) and retain the original box and packaging as inspection is often required by the carriers. Contact us on 1300 252 355 or info@suppsrus.com.au to let us know that you wish to return the item purchased. Please let us know why so we can rectify any problems in the future. You will be instructed to send the item back to us to the address specified by one of our staff. Place items you are returning in sturdy packaging. Make sure all items are packed tightly and securely. We are not responsible for breakage during shipment of returned items. Use the mailing address label to address your return shipment. All goods returned to Supps R US will be inspected upon their return and in the case of faulty products, a replacement product will be sent at the expense of Supps R US or a refund issued. In the case of non-faulty goods returned to Supps R US, we reserve the right to deduct the standard restocking fee from any refund issued, or to return the goods to the customer at the customer’s expense.